To make passion fruit cream, whip the cream, sour cream and vanilla together until thick. Fold through the passionfruit. Cover and refrigerate until ready to serve. Cut the cheeks from the mangoes. Score the mango cheeks. Spoon the sugar onto a plate. Heat a large, non-stick frying pan over high heat. Dip 2-3 mango cheeks (see tip), cut-side down, into sugar. Place a sheet of baking paper into the hot pan, then add mangoes, cut-side down. Cook for 3-4 minutes, or until sugar has caramelised. Using tongs, lift mango cheeks onto a tray, cut side up. Discard the paper. Repeat with remaining mangoes and sugar. Serve mangoes with passion fruit cream. Best to cook in batches so the pan stays hot and mango doesn’t stew. You can also cook mangoes on a flat plate of a barbecue if you prefer. They are delicious served with coconut ice-cream. 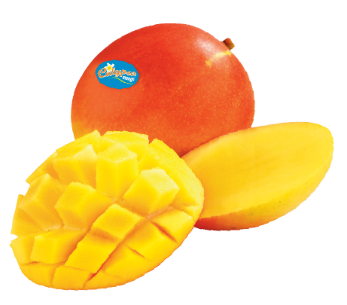 Why you use Calypso® Mango for this recipe?